Once in a while, the choice becomes a simple, almost clichéd one. This December, I was presented with two series from Manga Entertainment to review, and the first show I chose to review was the eye-candy one, Kabaneri of the Iron Fortress, a horror action show that looks divine, wonderfully animated, but is lacking in substance, and is wholly derivative. 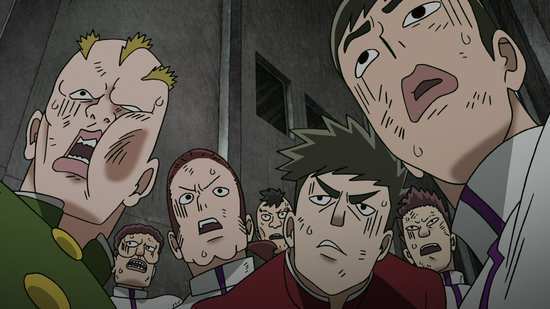 I left the other show, this Mob Psycho 100 for last, as it looked the exact opposite, pretty unimpressive in screenshot form, a show that belonged in the Liquid TV slot on early nineties BBC2, a cross between Aeon Flux and Beavis and Butthead. If this review holds true to narrative convention, this will turn out to be the better show, the one with substance and originality. Besides, it’s from the creator of the brilliant One Punch Man. 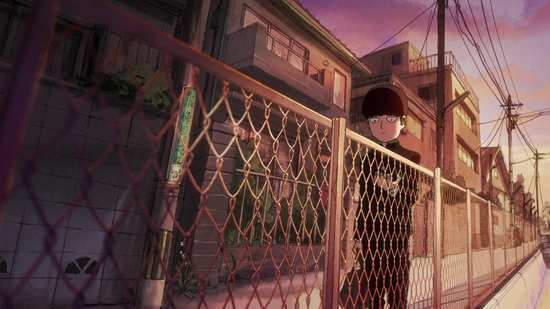 Shigeo “Mob” Kageyama is a middle school student with an amazing psychic ability. He used to try to impress the girl he likes, Tsubomi when they were kids, but she got bored, and since then he just wants to be one of the normal people, and get Tsubomi’s attention again. The problem is, as he shut off his powers, so he shut off his emotions. 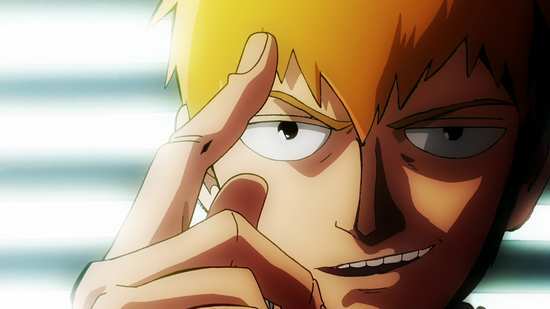 He does have a mentor though, an exorcist named Reigen Arataka (a talentless con artist who’s lucked out in befriending someone who can actually exorcise evil spirits). Reigen’s helping Mob control his powers, to prevent his emotions from overwhelming him. 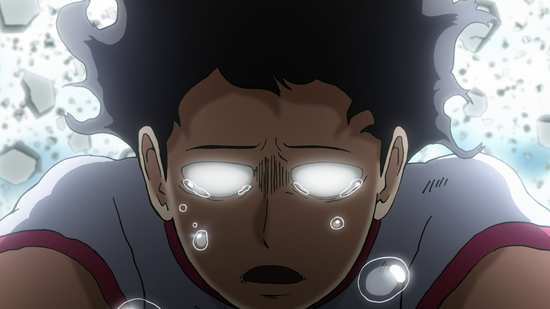 Because if Mob’s emotional power reaches 100%, he explodes! 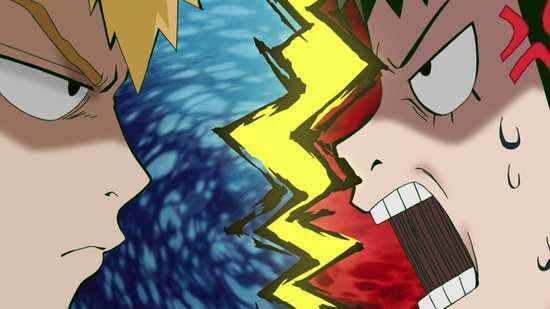 12 episodes of Mob Psycho 100: Season 1 are presented across 2 discs from Manga Entertainment. This is a combo release, but for this review I’m looking at the Blu-ray. Mob Psycho 100 gets a 1.78:1 widescreen 1080p transfer. It’s the usual for an anime Blu-ray from Funimation, clear and sharp throughout, with consistent colours, and smooth fluid animation. That visual aesthetic I mentioned in my opening paragraph really doesn’t apply when you watch the show. The characters may be simplistic and verging on caricature at times, but in motion the show is inventive and energetic, with masterful direction and a style that really brings across the character’s various psychic powers in a way that enthrals. You have the choice between Dolby TrueHD 5.1 Surround English and 2.0 Stereo Japanese, and for a change, the subtitles and signs are wholly optional. I was happy with the original language track, and the subtitles are timed accurately and free of typos. The action comes across well, and the show gets some nice, quirky music. I gave the dub a quick try, and from what I sampled, it sounds like one of the good ones. The discs present their content with animated menus, and at the end of each disc there are a few pages of translated credits. The extras on disc 2 have the substantial Mob Psycho Mini episodes, 6 of them running to 39:54 in total. These cute animations opt for 8-bit style graphics to represent the show’s characters, as these little addenda to the episodes have more fun with the story. These are in subtitled Japanese only. You have a 2:21 Promo Video for the show, a 16 second Flipbook Video, 1:06 of Commercials, and the Textless Ending. Naturally when I learned that Mob Psycho 100 was created by ONE, who also created One Punch Man, I was all poised to compare the two. After all, One Punch Man was a blast, an unlikely twist on the superhero genre, introducing an unassuming hero that was just too strong, so strong in fact that his super-heroing was done from a place of total apathy. 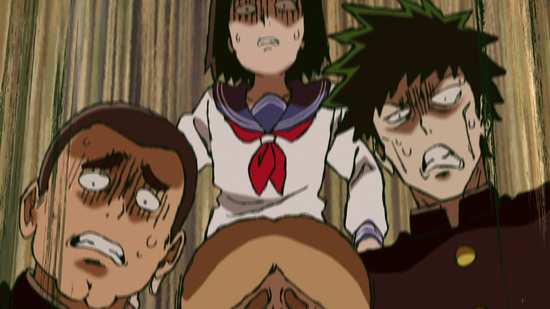 My initial impression of Mob Psycho 100 was of a show with more than a passing similarity to its forebear, and I have to admit that its commonalities with One Punch Man made it feel unoriginal. It took a while before I started to enjoy it on its own merits. Mob Psycho 100 is really quite good, and even better is the knowledge that a second season is forthcoming. 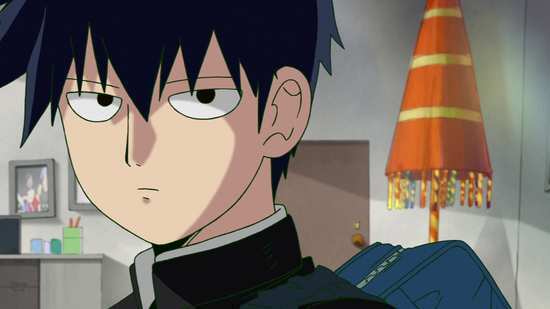 Shigeo “Mob” Kageyama is the protagonist, and just like One Punch Man, he’s unlikely looking, unassuming, and understated. He’s the wimpy kid who has trouble making friends, has no physical strength or stamina, and isn’t really enthusiastic about anything, except the girl he’s sweet on in school. When they were little kids, he used to impress her with his psychic powers, levitating stuff, and that worked until she got bored. Since then he’s avoided using his abilities, which has had the added effect of putting a limiter on his emotions. So now when his emotional ‘meter’ hits 100, he loses control of his abilities and thing get messy. 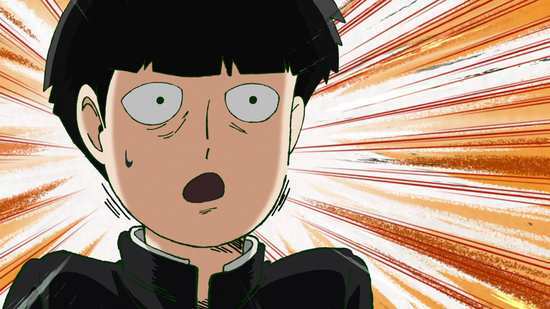 Mob has one ambition, to be a normal boy, and to that end he’s gone to an exorcist for help. Reigen Arataka is a conman, who applies his ‘cures’ and ‘exorcisms’ to the gullible, which helps him make a living. 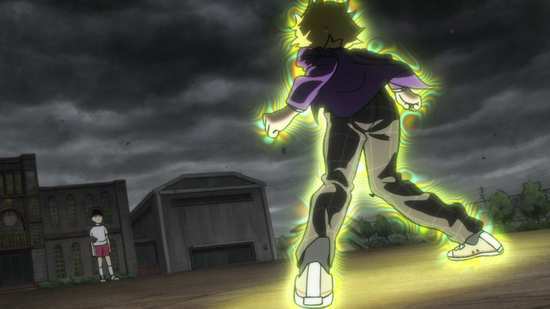 But when he sees Mob, the genuine article, he realises that he can up his game, so he takes Mob on as an apprentice, offering to help him control his powers, while using him to do some genuine exorcising. Also like One Punch Man, the story starts small, but expands in scope over the run of the series, with the challenges that Mob faces getting larger and larger. It begins with Mob trying to experience more of his school life, trying to be more outgoing, although he almost ends up in the school Telepathy Club, which is hardly a step forward. 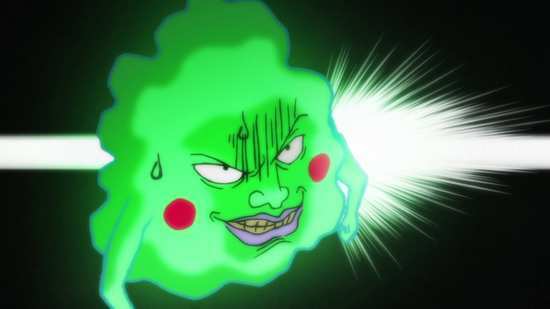 Mob winds up dragged into a religious cult, where the cult leader is possessed by an evil spirit called Dimple who uses his psychic powers to control his followers. When those powers don’t work on Mob, and Mob shuts down the cult, Dimple latches onto Mob and becomes a sort of malevolent sidekick. School rivalry can get hectic when the rival school gang is led by a psychic, while things really get complicated when Mob’s younger brother suddenly awakens to his psychic abilities. All this time, Ritsu has been envious of his older brother’s powers, and Mob has always envied Ritsu’s academic skill, athleticism, and popularity in school. Of course there is an evil organisation trying to take over the world with psychic abilities, and that’s saved for the season finale. You could say that with Mob’s personality, and his overwhelming power, that this is One Punch Man redux, and it certainly adds to the comedy when a hyper-testosterone mega villain gets through boasting and pontificating, only to be squashed by Mob in an instant because he’s breached his emotional limit. But what makes this story different is that psychic abilities aren’t Mob’s goal, it’s normality. 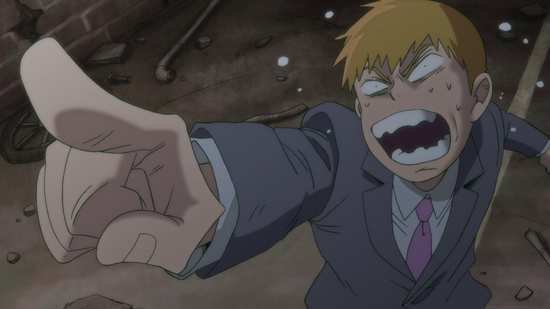 And self-serving conman though he is, Reigen is the unlikeliest hero of the show. He may want to use Mob’s powers to make his own life easier, but he somehow keeps on saying the right thing, encouraging Mob in just the way he needs. By the end of the series, an interesting team, a likeable group of characters have formed around Mob, and it leaves you hungry for more.